Dog trainer extraordinaire is under investigation for animal cruelty allegations. 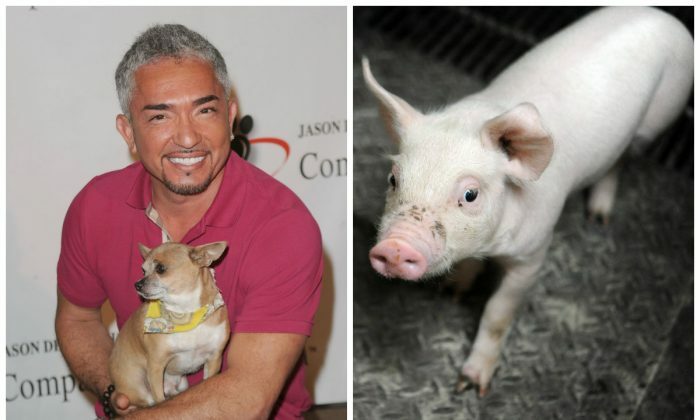 Cesar Millan, the well-known dog trainer nicknamed the “Dog Whisperer,” is under investigation for animal cruelty by L.A. County’s Department of Animal Care and Control. The Feb. 26 episode of “Cesar 911” featured Simon—a French bulldog and Boston terrier mix—that displays severe aggressive behavior toward other animals. Simon especially dislikes pigs. In one incident recounted by Simon’s owner Sandy, the dog attacked two pet pigs, leaving one dead and the other injured so severely that it had to be put down. NBC4 reported that Millan was out of town on a business trip during the authorities’ visit; Millan was subsequently issued a notice requiring him to contact investigators within 24-hours. The above video, depicting the controversial clip, is featured on the Change.org petition page. In a controlled training session at Millan’s Dog Psychology Center, Simon was placed in a pen with a number of Millan’s pigs. The dog, unleashed and unmuzzled, repeatedly chased the pigs and bit one pig’s ear, drawing blood. A Change.org petition to ban “Cesar 911” from television was started on March 7. As of March 11, the petition had garnered 9,108 signatures. This is not the first time the ‘Dog Whisperer” has been criticized for his training methods.